Don’t give me your, “I don’t have time for breakfast” spiel. We all got places to be. 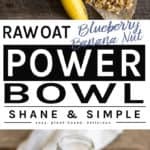 Stop for 5 minutes, make this Raw Oat Blueberry Banana Nut Power Bowl and show your heart and colon some love. 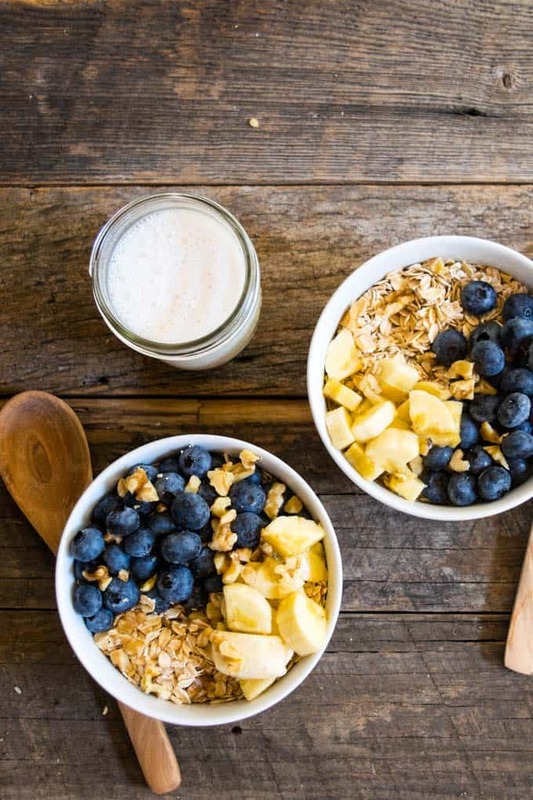 You’ve probably eaten oatmeal hundreds of times. But, have you ever tried eating it raw? It’s a funky adventure. I started eating oatmeal raw one morning last summer. It was hot and I didn’t feel like cooking. So, I poured some into a bowl, threw a banana on top, added a little vanilla almond milk, and PRESTO – a masterpiece was born! I’ve tinkered with the recipe just a bit since then. And, I’ve finally settled on what I think is a brilliant combination. But, that’s just me. 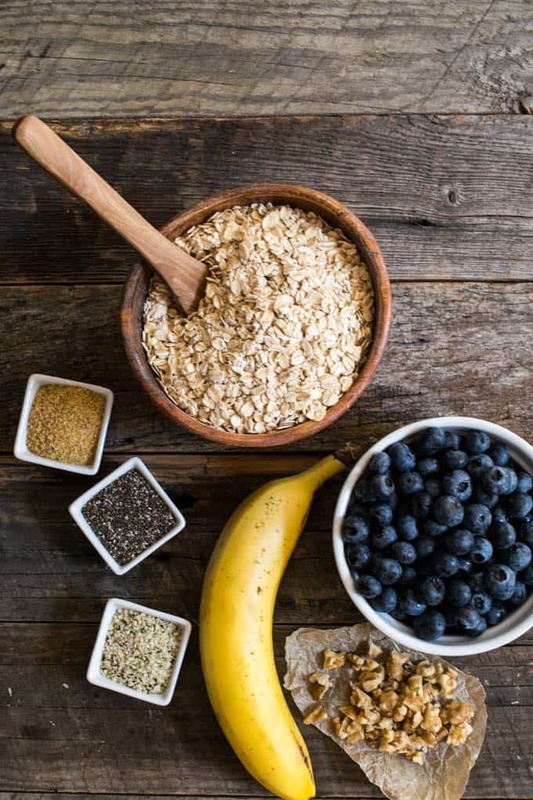 Oats are one of the most nutrient dense foods. Just half a cup contains 13 grams of protein and 10 grams of fiber. But, that’s just barely scratching the surface. There’s also an abundance of Manganese, Phosphorus, Magnesium, Copper, and Iron in oats. 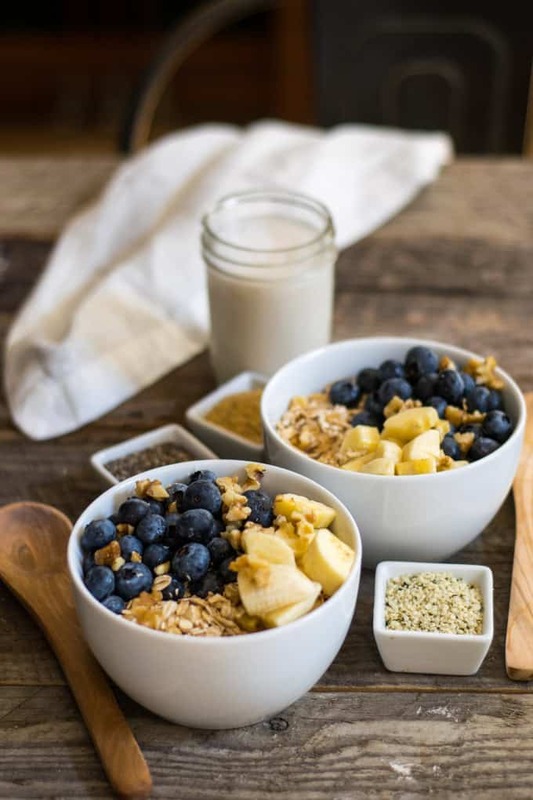 Studies have repeatedly confirmed that oats help to lower cholesterol, which helps reduce the risk of heart disease. 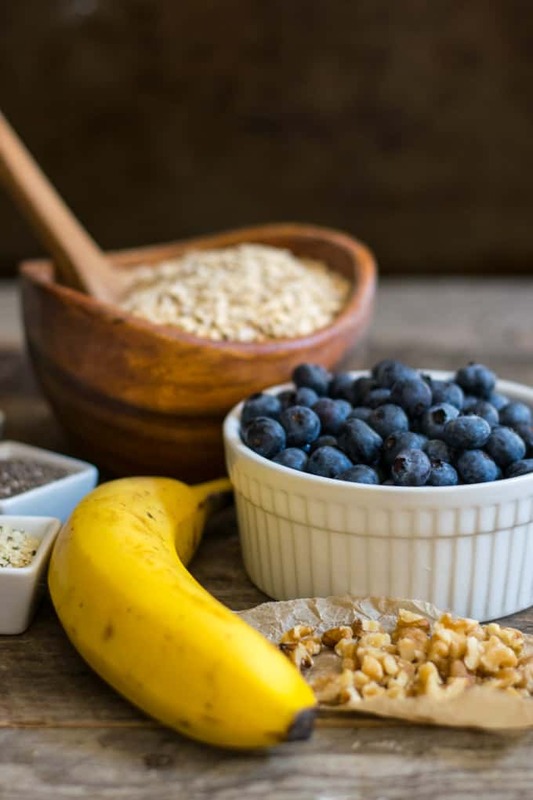 Oats also help lower blood pressure and reduce the risk of obesity and type 2 diabetes. 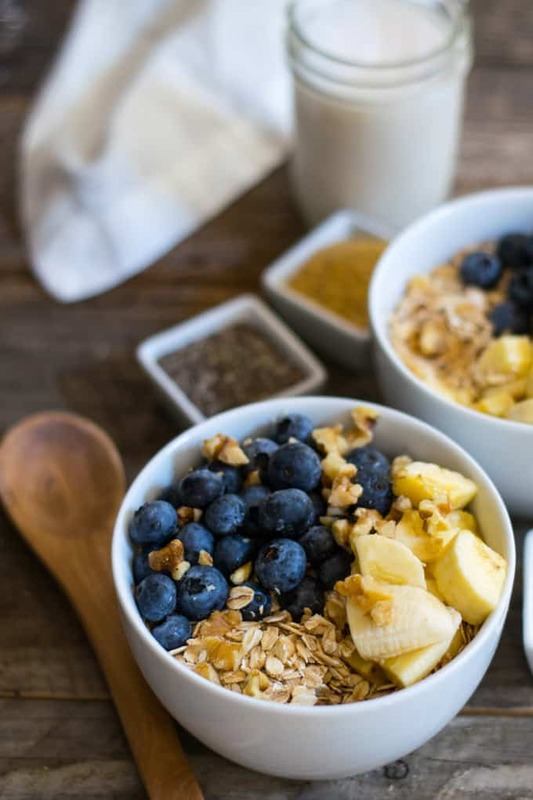 If you’re not eating oats, it’s time to start. And, what about the benefits of the toppings? Wow! Blueberries are a rich source of vitamin C, vitamin K, vitamin B6, folate, potassium, copper, and manganese. Blueberries have the highest amount of antioxidants in them compared to all the foods! And, they are a powerhouse when it comes to helping prevent cancer. Bananas help lower blood pressure, help to prevent colo-rectal cancer, aid in weight-loss, and cure diabetes. Walnuts can help prevent cancer, aid in weight management, improve heart function, and are great for brain health. Walnuts also have a positive impact on male fertility by improving sperm quality, quantity, & vitality. Plant food is MAN FOOD! So, as you can see, this little bowl is powerful! It may be simple and quick, but it is a freaking atomic bomb in fighting disease. 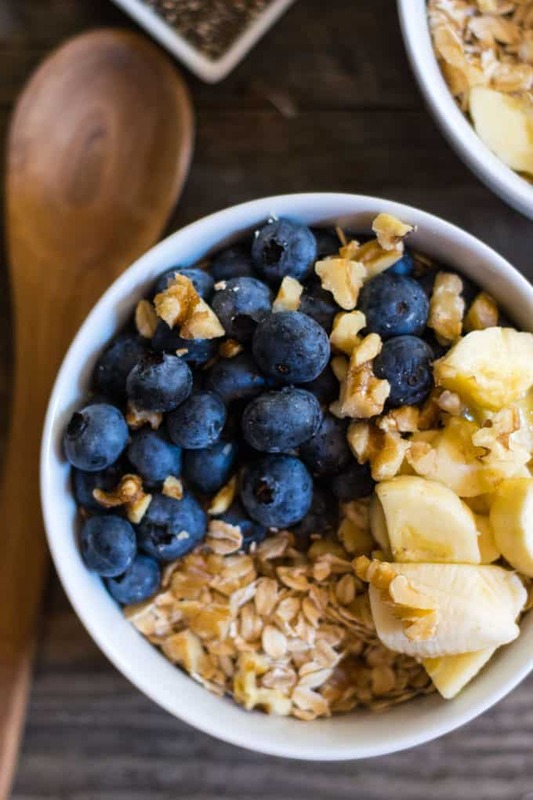 A delicious and amazingly healthy breakfast dish made with raw oats, blueberries, banana, and walnuts. Toss all ingredients into a bowl, mix well, cover with plant milk and eat. Thank you Shane! Super yummy, and helpful for mixing up my options to aid in milk supply for nursing. Thank you, Nicole! So glad you enjoyed it. And, happy I can assist in helping grow a “plant-strong” child:) Blessings! really surprised how yummy this turned out! it seemed too simple! I had to switch it up as i didn’t have walnuts and crushed up some cashew. (and i also added a touch of honey!) Yum! Thank you! Lisa, that’s awesome! So glad you enjoyed it. I’m constantly amazed how delicious the simplest things are. Peace. Best ever! 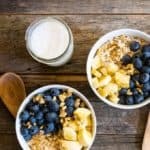 Quick and delicious; better even than overnight oats! The only change I made, was I added 1/2 t. of pure vanilla extract to my almond milk before mixing it in. So glad you enjoyed it, Lisa! And, love the idea of the vanilla. Thanks for sharing! Peace. That sounds delicious. I’m gonna give it a try tomorrow. Thank you! Hope you enjoy it. It’s super easy, filling and delicious. One of my favorites!